As you know, I keep processing Skype vs. H.323 and other ramifications and changes in the videoconference world. 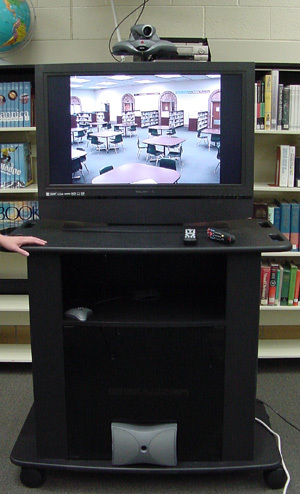 One thing I’ve been thinking about is how stable and sustainable a videoconference cart is. Our Polycom Viewstations from 1999 are for the most part still running! And teachers haven’t had to relearn how to use them in 11 years. Free services can have flaky, unreliable service. Think of the December 2010 2 day outage of Skype. Sustainability. You might try all these other free little VC tools. The quality is iffy & the site may go away. You can certainly dabble in using it in your classroom; but if you want to do anything sustainable you need something you can count on. Some teachers are happy to change up tech tools every six months or so. But many other teachers will not waste their time learning something they can’t count on being around in the future. Changing tech tools often jades them on technology and soon they don’t want to try anything new. With free sites, often the product they are selling is YOU! Read more here. Do we really need that in education?! What do you think? Does the “free-ness” of free tools outweigh the disadvantages? Or do you think we should be cautious and thoughtful about investing time and energy in free tools? Yesterday I had a couple of excellent meetings with our district tech directors. We were discussing bringing desktop videoconferencing to our classrooms with interactive whiteboards or even just projectors to use as classroom based videoconferencing. We had a great discussion on the different ways to do the web cameras. I had only been thinking about a basic under-$100 web cam. But they had some other creative comments. Our Berrien Springs district has a long term collaboration with a school in Korea – using Skype. They have been experimenting with different webcams. They found that the teacher prefers a web cam with a wider field of view than the newer HD web cams that have a much narrower field of view. In addition, they’ve been using a wireless mic with great success. Still waiting to hear which it is. I learned yesterday that some document cameras can be used as a webcam. That if they come with a TWAIN driver, then they can be used as a USB webcam. But most document cameras only use USB to get pictures off the document camera; not as a webcam. Another district is considering whether they can find a document camera with enough features that can also be the camera for the videoconference. Imagine being able to use the same camera to show the class or a document. Could be easy for teachers. Remember when you could connect a camera via firewire to your computer and use that for your camera? We’ve mostly lost that functionality with USB connections. However, a couple tech directors shared about camcorders that could stream through USB. This would make an excellent camera for the desktop VC as well. Someone suggested to me that I have our districts standardize all on the same webcam. But after hearing the discussion yesterday, I think we’ll get better research and ideas if we let them try out different options. What webcams are you using? What do you prefer? What criteria are you using to choose? Please comment! At about 9:15 when my first calls started coming up, the whole county was under a tornado warning. Originally it was till 10:00 am, but then extended to 10:45 am. Six of my videoconferences were affected. I spent a goodly amount of time on the floor under a desk away from the window with my phone and laptop/Skype texting and messaging to rearrange, reschedule, and calm down involved educators. Four of the VCs we were able to reschedule for this afternoon. Reflection question: What is the craziest thing you’ve done to make sure your videoconferences happened? Here are some of the monster pairs from today. Lots of great comparisons and discussions: what is the same? what is different? what could we have written better? We also had several classes in the TWICE ASK program with author Dana Lehman, on two of her picture books: Adventures at Walnut Grove and I Double Dare You. Students asked questions about bullying and teasing, as well as the writing and publishing process. Great program! Another class connected to The Cleveland Zoo for their Boo! I’m a Bat program. Great session. Had two classes participate in last week’s program as well. Great visuals & costumes! Finally, due to the tornado and a couple other problems, in one of my sessions, the teacher did the videoconference on her own! with a desktop videoconferencing solution that we are currently testing (and will remain unnamed). The software was installed on the teacher’s computer. Check out the video we received from them. Can’t tell the difference between this and a regular codec! Yay! What a day! How did your VCs go today? I want to give a login to my (as yet undetermined) desktop videoconferencing solution to an author in her home so she can talk to my students. I want to give a login to a guest speaker my teacher invited to talk to her students (a guest speaker with no access to an H323 videoconference appliance). My teacher knows a teacher in Oregon (or California or the district across the state) and they want to VC together. My teacher wants to use our H323 Polycom system. The other teacher doesn’t have access to H323. I want to give the other teacher a temporary login to our desktop solution. Some day, this dream, and others will come true! 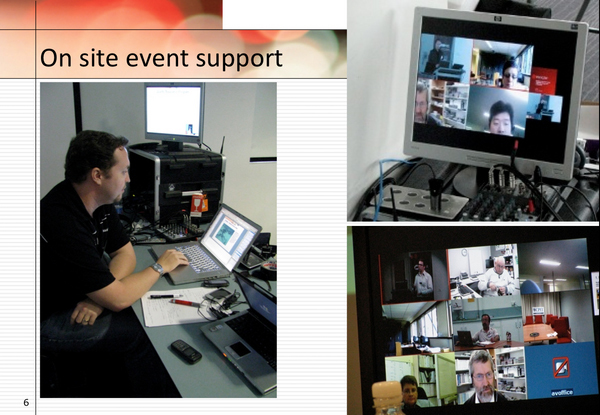 The Desktop Video Project Group (DVPG) was formed to evaluate desktop based video conferencing solutions to be used in Australian Universities and Research institutions. This group believes that there is no “one‐size fits all” when it comes to desktop video conferencing. … This group has completed a review of a broader range of “off‐the‐shelf” applications that are grouped into particular “types” that have been evaluated to offer a broader and greater relevance for institutional users and support teams. The project also includes some very helpful definitions of different types of conferencing. Given the blurring of lines between room, desktop, H323, nonH323, etc. and the growing casual undefined use of the term telepresence, these definitions are very helpful. The project includes lists of different scenarios of use for desktop videoconferencing -the scope and range of the list is very comprehensive! The checklist used to evaluate each product is very helpful and can be used adapted by any organization. The full report is online here in PDF. This post continues the journey to figure out how to get videoconferencing in the 21st century classrooms in our county. Remember my original vision from 2008 as well. The other tool that is really catching my attention is Polycom’s CMA Desktop. When I first learned about Polycom CMA Desktop, it had two drawbacks: the requirement to be on the same network as the CMA server (via VPN or physically), and it didn’t work on the Mac. Both of these have since been resolved. In the month of March, thanks to Aaron Schippert at Saginaw ISD, I was able to play with the Polycom CMA Desktop and I’m really quite excited about it. I’m thinking in particular of two of my districts installing interactive whiteboards in all their classrooms, and wanting VC in every classroom if it can be done well. I’m also thinking of my schools that still don’t have VC, as well as participants from my March session of Planning Interactive Curriculum Connections who were using only Skype. Once they learned what they were missing in H323 content, they were so eager to get H323 VC, but funding is a huge problem. One of the participants had set up a Skype cart for their school. What if, for a small fee, they could get H323 VC on their Skype cart as well??!! It’s super easy like Skype. It has your contact list and an easy call button. It will call an IP address or another person (by name) registered to the CMA server. No echo! Echo cancellation is built in. In our test, we didn’t have to install an additional mic. Polycom CMA Desktop used the audio from the Logitech camera. With no echo. (Better than Skype! I’ve heard a lot of echos on Skype calls!) Echo cancellation is a huge issue when trying to morph desktop VC to work in a classroom. Quality. In my initial tests with a login from Saginaw ISD, the video and audio is GREAT! Scalability and cost. The cost structure is definitely a pro. After investing in the server, you can have unlimited downloads of the client software!!! Of course, depending on how many licenses you buy (100, 200, 400, 500, & up), you can only have that many people logged in at the same time; and a slightly smaller percentage of those actually in a call at a time depending on setup. But teachers aren’t going to use VC all the time, so if you can just have them logout when they aren’t using it, this resource could stretch a LONG ways in education! Especially if you figure from the 10% use as normal use of VC – which I think is pretty close to a reasonable number when looking at the most VCs I have at the same time and how many codecs I support. It works on the Mac! (starting April 30). Yay! This of course is critical. Not interested without Mac support. When installed with a Video Border Proxy (VBP), it works great across firewalls. No configuration changes to the firewall! I tested a login borrowed from Saginaw ISD while they had a demo VBP at their site. We installed it on a PC behind our firewall, hooked up a 3+ year old Logitech camera, logged in, and we were up and running. Beautiful. Connected fine to several H323 units off our network. No problem. (Note: I understand from talking our sales guys at Polycom that this may not work as well with corporate high security firewalls. In that scenario they recommend a VBP at each network edge.) Just imagine giving an author or expert a temporary login so they can come in via H323! I’ve learned that the reason this works is the new h.460 extension to the h.323 standard. It allows the server to set up a secure connection with the desktop to easily traverse the firewall. Note also that without the VBP, each user off the network has to VPN to connect to the CMA server. Not a good solution in our scenario. Dialing. Another benefit of installing with the VBP is the dialing benefits. I’ve learned that gatekeepers really do help with dialing. For example, if a VBP is installed with the Polycom RMX, the Tandberg bridge can dial in with the alias@IP format (using the VBP’s IP). I wasn’t able to actually test this, but I was told that Polycom endpoints off our network could dial in to a Polycom CMA Desktop user with the IP##alias format; and Tandberg endpoints off our network could dial in with the alias@IP format. This means that I could call out to a classroom involved in a VC, and the teacher would only have to have the computer on and logged into CMA Desktop. I have several districts where they need this level of support. Dialing in/out via H323 is another essential feature for our use of videoconferencing. H.239. As I got excited and started talking to my districts interested in VC in every classroom, they wanted to be able to share the computer. That means H.239 with Polycom CMA Desktop. If you’ve been reading my blog, you know I never use H.239 if I can help it, and I find it incredibly frustrating. There are too many situations where it fails. With a regular unit, that is easily solved by zooming the camera in on the laptop. But how would that work when the laptop IS your VC system? After learning how LifeSize handles H.239 last week, my expectations were raised. I thought I’d test to see how CMA Desktop works when sharing content with the other site having H.239 turned off. Just as expected, it did not allow sending content to Polycom MGC, Tandberg bridge, Codian bridge, Tandberg MXP endpoints all with H.239 turned off. The anomaly was my Polycom VSX 7000 (version 9.0.5.1) which accepted H.239 content whether or not H.239 was turned on, but that must be a fluke. So now I have to decide how critical desktop sharing is to my dream. I don’t want teachers to spend classroom time preparing a presentation and then find out the partner class can’t receive it. Note to Polycom, in a future version, when CMA Desktop detects the other site can’t receive content, could it just send the computer screen and not the webcam? Please! So far that’s all I can think of for a con. What about you? Hmm. If H.239 didn’t work with the partner school, what about taking the little webcam and facing it to the laptop screen? For that matter the webcam could serve as a document camera by moving it around too. I’ll have to think about this more. Initially in my interest in morphing desktop VC for the classroom, I wasn’t interested in server based videoconferencing. I keep thinking of the schools that install Polycom PVX and are up and running tolerably well. It is such a low cost entry starting place. How would they get started without that? Of course PVX is painful to get working through the firewall. But still, it’s an easy low cost starting place (read a success story here). As I’ve learned more, though, I understand that Skype works so well because it too is using a “server” – a distributed system/server of course – but still it’s not stand alone. It’s the server that helps make the VC on the desktop so super easy. So, now I’m thinking, educational service agencies or others could offer a service to schools to get access to Polycom CMA Desktop for less than the cost of the school/district getting their own server. This way tiny schools that want to start with H323 VC could get started without investing in a $8K cart or their own server. Then as they have funds they could upgrade to a full codec/cart once they saw the benefits of additional peripherals and quality. While I was thinking about this whole issue in March, I ran across this article on how Dr. Phil switched from Skype to Polycom CMA Desktop (and other endpoints/infastructure). Very very interesting! This post concludes (for now) my little journey into desktop VC. I realize some glaring omissions include LifeSize Desktop and Tandberg Movi. But I don’t know any K12 people who have an installation that I could play with and learn about in an unbiased fashion. Plus spring break is about over and I’m about to get sucked into the last 2 months of busy VCs for the school year. So feel free to comment if you have anything to add to this thread and I’ll try to add more to it later. Maybe at the ISTE playground in June I’ll get more info to share. I also was awarded a SmartBoard with all the trimmings with the MACUL Educator of the Year award, and once that is installed, I will be playing further to see what could possibly work. That’s a summer project too. Thanks, everyone for your comments and questions as we all learn together! Full disclosure: Polycom funds the Berrien RESA VC Content Provider Database. They also link to my blog. However, they do not dictate, edit, or pre-approve anything I write here.